In November 2013, top Chinese leaders released their “Decision” coming out of the Third Plenum of the 18th Central Committee of the CCP. The decision, which outlined a series of reforms planned by the leadership, caused exuberance among many observers — and markets in Asia rallied. 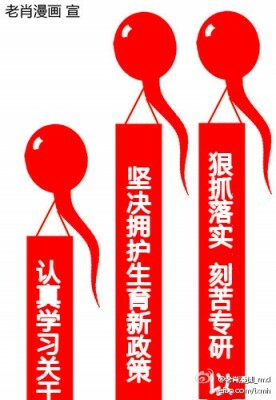 Others were less excited about the Party’s decision, which was articulated in dense Partyspeak, and noted there were no hints of the kinds of institutional reforms necessary to make promises (on issues like land reform, for example) real. 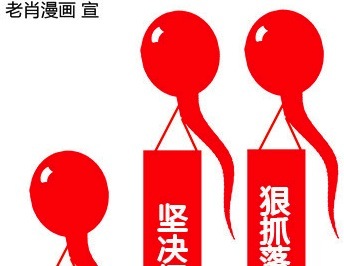 The above cartoon, posted by artist Lao Xiao (老肖) to Sina Weibo, depicts the language coming out of the recent plenum as red banners being lifted skyward on balloons of red sperm. The reference to self pleasure goes without saying.